Today, Microsoft released new, ninth version of its Internet Explorer browser. It’s standard compliant, blazingly fast, with streamlined UI and tons of new features. Unlike previous IE versions it’s a product that can compete with browsers from other vendors. Let’s look at the timeline, year 2001. Netscape is on the death row. Two years left to the release of Safari 1.0, and three years to the first Firefox release. IE dominates the world with 90% market share. IE6 bundled with Windows XP was an advanced browser for its time. It came with many new features, such as drag and drop, XMLHttpRequest (the core of then-modern AJAX concept), Editable Content (it powers rich-text editing found in every modern web-based email client). Let’s see the figures. We have analyzed over 1 million requests to TeamDesk applications made for first two weeks of March 2011. Noise data – values below 0.5% – were removed. And here come the numbers, by browser, by version. 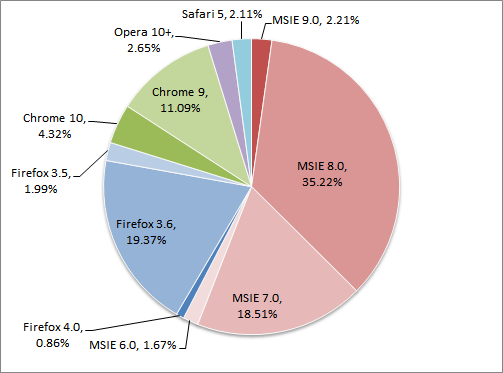 Excluding IE family, oldest browser in the list is Firefox 3.5 which was released in 2009 – it means it is quite good in modern standards support, and it’s user share is comparable with IE6 released a decade ago. Now, in 2011, it’s time to kiss IE6 goodbye. Microsoft started the campaign to move the world off the Internet Explorer 6 and we are joining the cause, as our IE6 user share does not exceed 2%. For now, IE6 users will be presented with the banner prompting them to upgrade to modern browser version. And from now on, we’ll gradually cease support for IE6 in TeamDesk applications. It does not mean TeamDesk will stop working in IE6 today; it means, while planning new features we won’t count on restrictions and quirks imposed by an ancient browser. Glad to hear it! This must make things easier for the developers! It’s not hard to provide support for IE6 – so far there is a minimum of code forks to target it. Yet its age and bugs keeping us from using more advanced techniques and technologies.